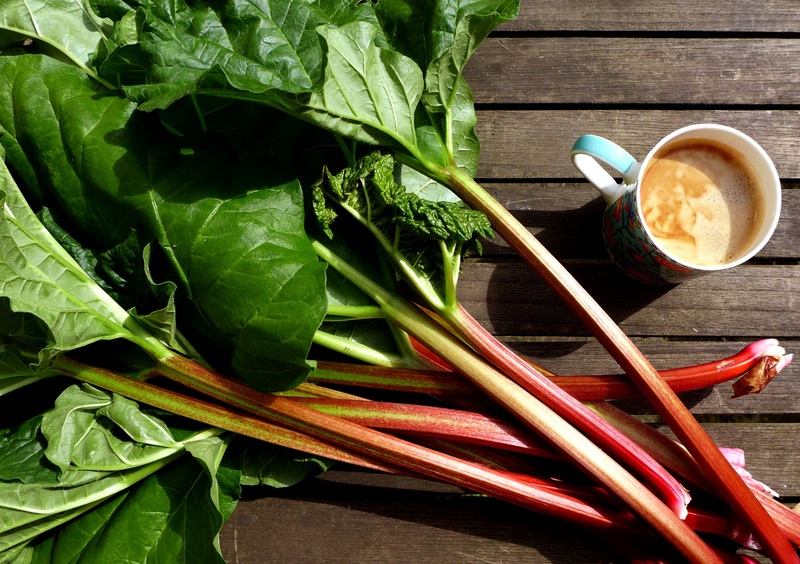 One exception is rhubarb, either bright pink and forced in the growing sheds of the famous Rhubarb Triangle of west Yorkshire or like ours, already poking up in the veg patch. 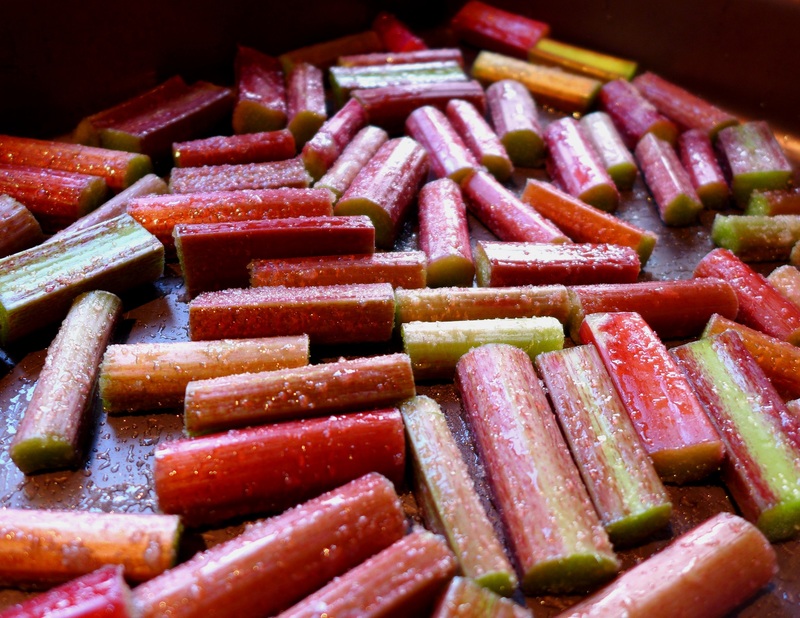 I thought it might be useful to collate all my rhubarb recipes in one place. Please excuse the quality of the early pictures, I’d like to think my photography has improved since I first invented Mrs Portly as my alter ego. I think the recipes themselves stand the test of time, though. Rhubarb and Raspberry Brownie: richly chocolately but with the sharp tang of the two fruits, this is good as a dessert with whipped cream or simply cut into squares with a cup of tea or coffee. Rhubarb Bakewell Tart: a personal favourite. 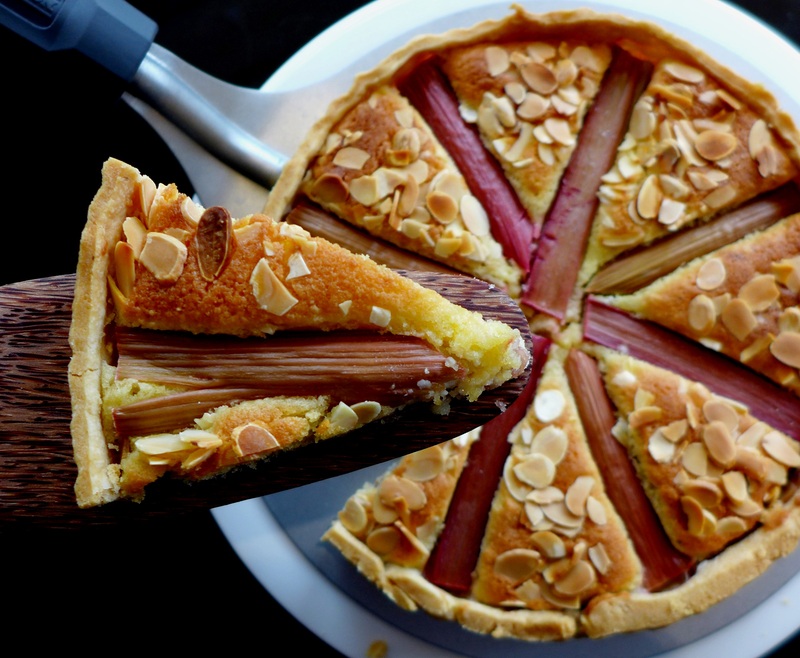 Crisp pastry, frangipane, fresh rhubarb, a hidden layer of raspberry jam and flaked almonds. Mmm, make mine a large slice. Rhubarb and Orange Friands: rhubarb and oranges are best mates and they snuggle up together very companionably in these light-as-a-feather friands, nicest eaten the day they’re made. Rhubarb and Raspberry Pie: we’re back to raspberries again, I love them in combination with rhubarb and this is such a fresh-tasting filling. I used some of last summer’s raspberries from the freezer, but there are imported fruits already in the shops in you’d prefer to use fresh. 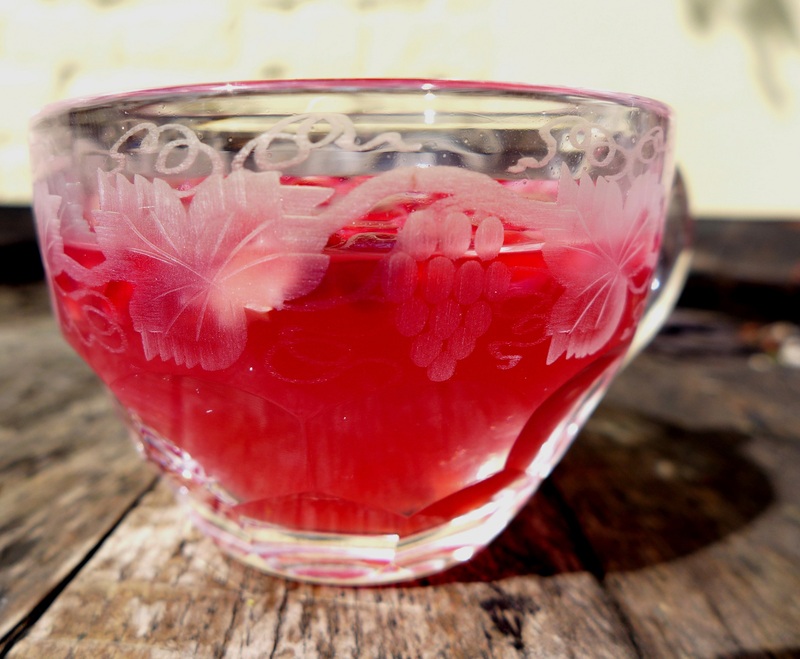 Rhubarb and Pomegranate Jelly: wobbly, tangy, pink and pretty, this is the perfect light end to a meal. Low in calories, too, compared to a fat wedge of pie! Rhubarb and Raspberry Crumble: my other key favourite. I think the chopped hazelnuts in the crumble mixture marry really well with the fruity filling. I’m a sucker for crumbles. Rhubarb Scrumple: a lighter version of a crumble, made with granola and Amaretti biscuits, one you can whip up and have on the table quite quickly. Rhubarb, Rhubarb, Rhubarb: an early effort when I hadn’t learned that one recipe per post is enough for anyone, this includes rhubarb fool, rhubarb parfait and a rhubarb and ginger ice cream. Spiced Duck with Rhubarb: if you don’t have a sweet tooth, try rhubarb as a sharp sauce for something rich like duck. The flavours are fabulous. This is best made with bright pink forced rhubarb if you can get it, as the sauce will be a much cheerier colour. This entry was posted in Desserts, cakes and biscuits, In the garden and tagged rhubarb and ginger ice cream, rhubarb and orange friands, rhubarb and pomegranate jelly, rhubarb and raspberry brownie, rhubarb and raspberry crumble, rhubarb and raspberry pie, rhubarb Bakewell tart, rhubarb fool, rhubarb parfait, rhubarb recipes, rhubarb scrumple, spiced duck with rhubarb, spring recipes by Linda Duffin. Bookmark the permalink. They all look good. Today, I’m going for the Bakewell tart option. Make mine a large slice too. Strawberry Rhubarb pie is tasty as well. All those ideas sound fantastic though. I really want the Crumble now! Our strawbs won’t be ready for months, sadly, although some of the imported ones are okay. You’re right, it is a lovely combo. Wish I could post you some crumble! I’ve never thought of that, Sandra, must give it a try. Thanks! Thank god, it’s finally spring. I watched some interesting rhubarb cookery on Masterchef last night. My Mum used to make a mean fool. Very tasty. Didn’t see that, must have a rummage online. I do love rhubarb. We love our rhubarb over this way and it’s always good to get new recipes. Our plant has yet to show any life, but I know it coming soon. I really like the looks of your Rhubarb Bakewell Tart and will be put that recipe to work soon. 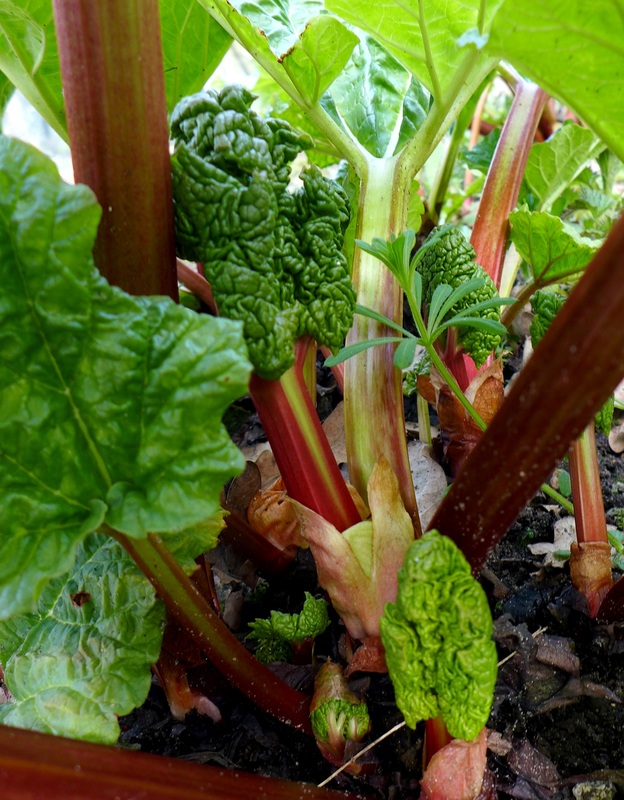 Thanks for sharing all your dandy rhubarb recipes. Thanks again, Ron. I really appreciate your support! Some lovely recipes here Linda. I really need to check how mine is doing on the allotment but I’m currently in Suffolk doing a spot of gardening. I have shared to my facebook page.